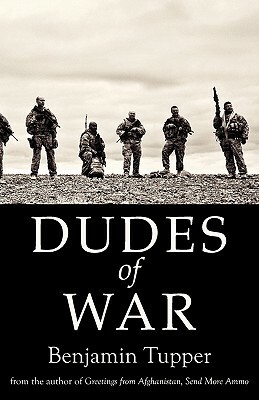 "Dudes of War" is an enlightening and uncensored introduction to modern American soldier culture. As told through personal vignettes of men serving in Afghanistan, this revealing account of life on the bases and in the hootches explores the good times and bad habits of today's soldier at war. From the pranks and humor and heartbreaks, to the hobbies, lingo, and vices, "Dudes of War" is a no-holds-barred tour of life down range. "Tupper is a sharp, honest guy...He's no meathead, but he's still a dude" - Newsweek.com " Tupper deploys a razor wit and an unusual level of sensitivity and compassion towards profiling the men of his combat unit while in Afghanistan. "Dudes of War" is a fantastic glimpse into the lives of soldiers in Afghanistan." - Johnny Rico, Author, Blood Makes the Grass Grow Green.